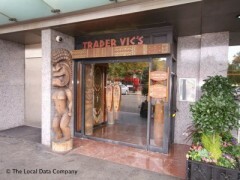 About: Trader Vic's is located inside the London Hilton on Park Lane and many visit simply to imbibe from the world famous cocktail list. There is also a restaurant serving food from an international menu, based on a Polynesian theme. Decor is beach-hut meets Bond Street. Service is friendly, swift and brightly dressed. If you need cheering up - start here. Wear your best shirt. Attract the honeys. It may be in the basement of the Park Lane Hotel, but Trader Vic’s is not your average hotel bar. A tiki themed bar, the Samoan/South Seas style shack is an institution in London. The Mai Tai was invented in the original Trader Vic’s (in the USA) and the tradition continues with a 40-long cocktail list. Open till 3am. It's famous for being a Polynesian-themed cocktail bar, but it also does food. Reflecting the hotchpotch of cuisines that form Hawaiian gastronomy, there's Chinese and south east Asian ingredients, as well as of course poke. Elsewhere on the menu there is meat and seafood grilled in a wood-fired oven and served with tropical ingredients like coconut, pineapple, ginger and lemongrass. "Even after fifty years in business Trader Vic's is still a hidden gem "
Having been in residence in the basement of the Park Lane Hilton for over fifty-years, Trader Vic’s is something of a legend on the London bar scene. Quite literally part of the foundations at one of London’s most exclusive hotels, the bar is a sweet slice of tiki for guests and non-guests alike. When sunsets, sand and tropical weather are off the agenda – which is most of the year in London – a bar like Trader Vic’s does its thing. There aren’t many places that can claim to have invented a world famous cocktail but the Trader Vic’s chain is one of them. Originating in the United States, the original bar was the first to create the Mai Tai. Since the beginnings in 1934, the brand has spread throughout the world, bringing the Mai Tai madness wherever it went. The London outpost is bound to wrong-foot you when you descend from the Hilton lobby. Underground and out of sight, Trader Vic’s is all chic bamboo shack and refined Polynesian style. Pull up to the bar and get involved in one of the bar’s Mai Tai Masterclasses (where you get to learn the tricks behind creating the signature drink), join a high table or settle into the dining area and sample the Chinese-continental fusion cuisine. There’s plenty to look at down at Trader Vic’s but the standout feature for us were the handmade tiki mugs. Mermaids and gargoyles don the sculptural ceramic mugs and come filled with strong fruity concoctions like the Molokai Mike. Thanks to its exclusive home in the Hilton, Trader Vic’s is something of a secret gem, which makes the exotic atmosphere and overblown, ostentatious cocktails all the better for introducing people to.